The UFC has released the finalized card for their UFC 97 event in Montreal, Canada, an event that was almost cancelled due to some strange circumstances. 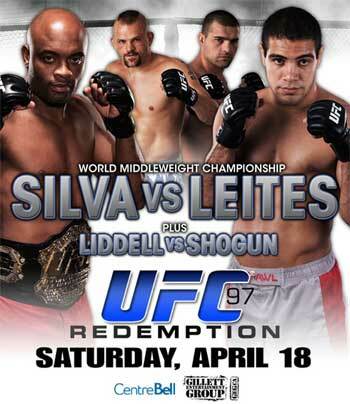 The card will be headlined by Anderson Silva’s middleweight title defense against Thales Leites. A day after tickets officially went on sale, the Quebec Athletic Commission threw the UFC a curveball when they told the organization they would not sanction the event under standardized North American MMA rules – UFC rules. After intense negotiations, the two sides were finally able to come to terms, and UFC fans will be able to enjoy the same regulations they have grown accustomed. After those formalities were ironed out, our neighbors to the north sold out the Bell Centre in just under six days. The UFC’s first journey up north was destined to be a success, as the country’s most famous athlete, Georges St-Pierre, took on champion Matt Serra at UFC 83 to unify the welterweight title. Exactly 21,390 enthusiastic Canadian fans went crazy as GSP dominated Serra for nearly10 minutes, before the fight was stopped in the 2ndRound. It garnered $5.1 million at the gate.